During the course of the long Thanksgiving weekend, Ames and I managed to meet my employers for the first time in person, attend 3 Thanksgiving parties, do some Christmas shopping, assemble our Christmas tree (for the first time in our new house) and rearrange the home office. While Amy worked on the perfect configuration for our 2 desks, bookcase, futon, filing cabinet, and office accessories, I decided to work out the kinks in our home network. Previously, I had the cable modem (top left) conntected to the uplink port on the Vonage router. I then used 3 of the 4 wired ports to connect the iMac, the PC, and the Printer/All-in-one. The 4th port was connected to the wall jack that I installed which runs under the house to the living room where it connects to our wireless router. The wireless router is connected to “The Box” (our little server/media center which is connected to the TV) and provides wireless access to Amy’s laptop. I set this up before we picked up Amy’s laptop and the wireless router. It worked great at the time because The Box was in the same workgroup as the rest of the computers even though it was out in the living room. 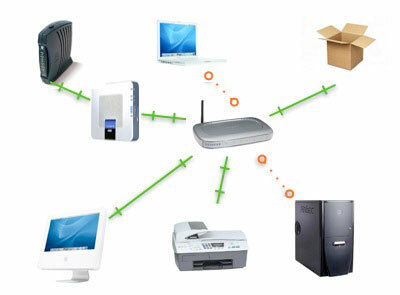 After we added the wireless router, getting into the box from the computers in the office became a major pain. I tried disabling DHCP on the router and setting The Box in the DMZ, but I still couldn’t get file and print sharing to work from the computers in the office. 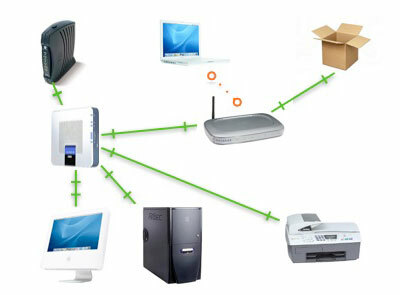 By moving the wireless router into the office and connecting everything to the network through it (rather than the vonage router) file and print sharing is now so much smoother. We’ve had a wireless PCI adapter in the PC for a while, and since it’s now on the opposite side of the office, we decided to utilize that rather than running a long cat5 around the room. 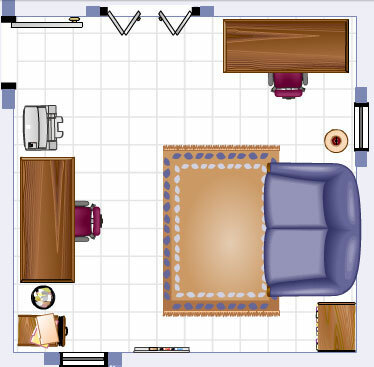 Amy used Better Homes and Gardens’ Arrange-a-Room tool to create the new furniture layout. No, we don’t have pink office chairs, a blue futon, or white “server-room” tile in the office, but the little online tool saved us a lot of time. So yea, even with the pretty Omni Graffle charts, and Amy’s furniture layout this is still quite possibly the most boring thing I’ve ever posted here. I don’t expect anybody to read this far into it or even find it useful. It’s really for posterity that I’m writing about our home network. You see, in a few months this network configuration will probably all change. In a few years I won’t even remember how I had things setup, and at some point I won’t even remember which computers we had when. I hope at that point that we will at least have flying cars or teleportation. Perhaps we’ll even have salmon flavored soda, USB beverage chillers or disappearing colored bubbles. I used to know the technical explanation for your problem; I probably even knew the solution, but for the time being, it has left my mind. When the solution returns, I’ll let you know 🙂 I guess you could try to make the wireless router a wireless bridge, but I’m not 100% sure it has that capability and once you get something working, there’s no point in fixing it again. Well we need the wired router for our Vonage service and we need the wireless router to provide wireless access to laptop…and now the PC. I guess we could consolidate those by buying the vonage router with wireless, but shelling out more money for a piece of equipment that does same job as the two I have now didn’t sound that appealing. Why don’t you just turn all your monitors so they “see the printer”? HAHA! Oh, wait… I tried that and it didn’t work.